Know what one of the hottest trends in home improvement is right now among the ‘fashionable ‘ set? 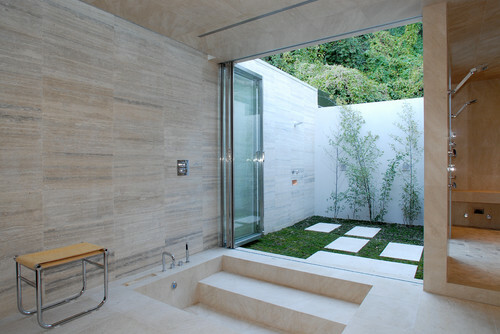 The indoor/outdoor bathroom. 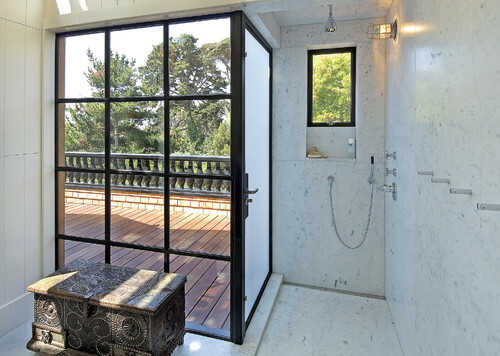 This amazing example of an indoor/outdoor bathroom offers a open indoor shower within a gorgeous glass tiled enclosure and then a simple outdoor shower on the deck. Privacy is afforded as needed by linen draperies and for those days when the homeowner feels like a good long soak in the bath they are still afforded the most tremendous views while being out of sight of the rest of the world. This very white bathroom almost has a wintry feel and yet the folding French doors afford it easy access to the fireplace enhanced patio beyond. Adding a little comfort and luxury is that big comfy armchair and all the fluffy towels. The clever use of a simple pane of frosted glass affords a measure of privacy in this smaller bathroom and yet the large unfrosted windows all the light – and the beautiful view – to dominate the space and create a spa like bathroom that would be a joy to make use of. 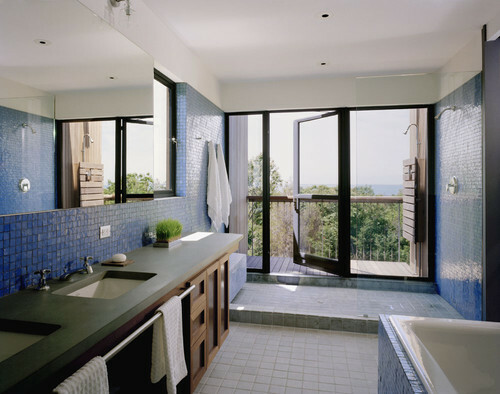 Depending upon their mood, and the weather, the owners of this bathroom can choose to make use of the simple outdoor shower, complete with pavers to keep their feet off the grass or to make use of the deep soaking tub while enjoying a view that has been concealed from the neighbours with an elegant privacy wall. 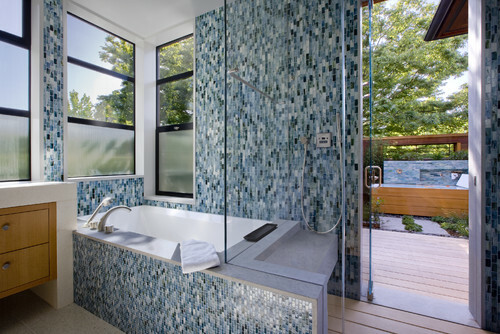 Mosiac tile is the star of this eyecatching and yet stunningly simple indoor outdoor bathroom that can be as open or as closed as its owner desires and offers both indoor and outdoor deep soaking tubs and a central placed shower that could be considered both. DIY Videos – Back Garden Outdoor Shower Choosing the Right Outdoor Kitchen Essentials Great New Landscaping Ideas – An Outdoor Shower Inspirations for a Great Basement Remodel Amazing and Affordable Ways to Create a Great Outdoor Living Space Outdoor Solar Lighting Basics – The Affordable Way To Light Up a Landscape in Style Hot Home Improvement Trends – Outdoor Home Theatre Architecture for Dogs – Your Next DIY Project?